The Farmers Wife: Thanks to my Fans, It's Giveaway time! Thanks to my Fans, It's Giveaway time! Good Morning all!! I have to say that I am so honored and flattered to announce the The Farmers Wife's Facebook page has reached over 200 fans!! I've been promising for awhile that once we reached 200 I would do a giveaway, and I have to be honest, we reached that number long before I thought I would! But thanks to all of you I have a great giveaway, one I am ecstatic about! Ready? Along with my friend Laurie Alves from Food is Love, I am giving away a copy of her NEW cookbook! I am so honored to have Laurie a part of this giveaway, and to promote her new book. I've actually had the chance to read the book myself and I have to say I was really blown away by this cookbook! Laurie has done a fabulous job of creating simple, yet elegant recipes for chef's of all ages! For me as a busy Mom, this is such a helpful tool and helps answer the daily question of "What's for dinner tonight?!?". I can't wait to try her Ham with Maple Orange Glaze for Easter this year, looks totally delicious and will help keep me out of the kitchen for the entire holiday! Can't wait to see what other books Laurie comes out with, and she is coming out with more books! We're giving away a full color PDF copy of this book, but you can also purchase the Kindle Version here. OK y'all, ready for the rules?!? 1. Be a fan of The Farmers Wife on facebook, already a fan? You're already qualified! 2. Be a fan of Food is Love's facebook page, already a fan of her's? You're already qualified! 3. Repost the link to the giveaway on your Facebook/Twitter accounts. 4. Leave me a comment here on this post, ALONG with your Email address, to let me know you've done all of that, and you're entered! Just one comment per person is fine with me! The giveaway will run until Friday, April 22nd, 2011 at 11:59pm MT. I will announce the winner on Saturday the 23rd. I need your email so that we can email you the information to get your copy downloaded. 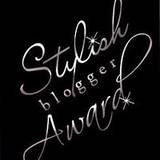 *You do NOT have to be US citizen to enter this contest, anyone from anywhere can enter! 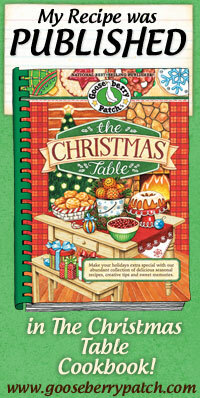 * The winner will get a full color PDF copy of the cookbook. Winner will be picked via a Random Number Generator. Good Luck! And thanks for all the Foodie love y'all!! Can't wait to see who wins!!! 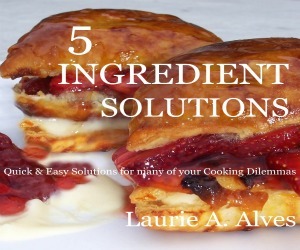 This giveaway is being sponsored by Laurie Alves of Food is Love, the Author of the book 5 Ingredient Solutions. Hey Farmers Wife, this is Angie from Angie's BIG Love of Food. I completed all the above and my email is AngieForester@hotmail.com Thanks so much! 200! So awesome :) I am a fan! 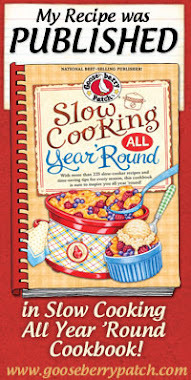 I can see why this cookbook would be awesome...i love simple meals on the weekdays! Kim, Thanks so much for the Wonderful Words, and the Fantastic Review! You are awesome, I cannot thank you enough for your support! I can't wait to see who the winner Is!!! Thanks Again! Looks Delicious! I'm a follower! And followed all the steps! How do you get a "like" button on every one of your posts?? I am also a FB fan of both pages!! I am a farmers wife also. we own a farm here in michigan. There is no better life then being a farmers wife is my modo. facebook fan! thanks for the great giveaway.... please enter me. I have a question, how did you get the pull down for your labels? Mine doesn't have that option that I can find anyway. Hiya Kim - your newest follower from The Country Cook. Contact me at trish0605@gmail.com. Thanks! Greeting! A new fan here! twiceblessed01@gmail.com Happy Easter! !